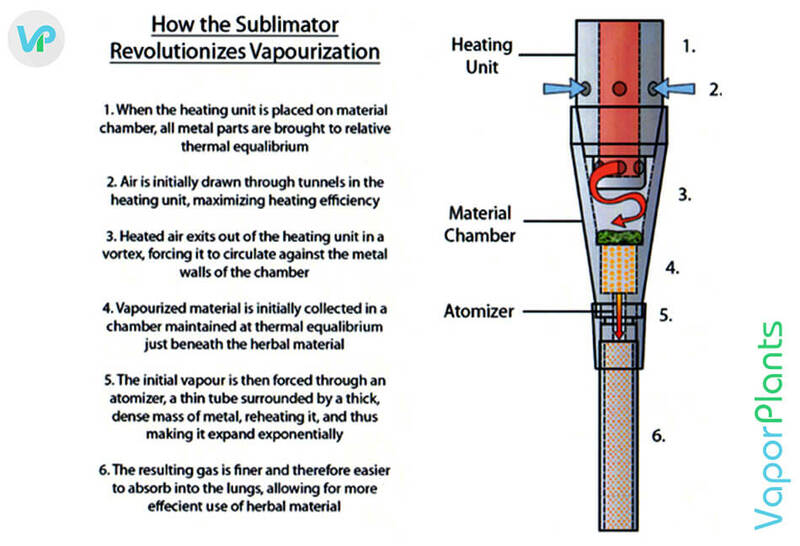 The Sublimator is a brand new concept in the world of vaping. It's called a gassification device rather than a vaporizer, as it uses thermal injection, radiation, and induction rather than just heat to extract vapor from materials. Suitable for dry herb, wax, and oil use, the model includes a wax bubbler to filter the vapor, and has a number of benefits and drawbacks as you'll see. - Price - The Sublimator is one of the most expensive desktop vaporizer models on the market. It comes in different kits, but each one costs at least $625, putting it in the same price range as the Volcano Vaporizer. - Vapor Quality - The strength of the Sublimator is in the quality of the vapor that it produces. This desktop vaporizer produces incredibly potent, large clouds of vapor, with even a small amount of material. It's highly efficient, and it creates vapor that tastes excellent and is very smooth. There is no combustion, and the vapor is very pure. From the standpoint of vapor quality, it does rival the Volcano model. Some people even claim that the quality of its vapor is better. - Guarantee - The Sublimator Vaporizer comes with a 1-year warranty on its electronic parts and a 10-year warranty on the metal parts. The 1-year portion of the warranty is a little short, considering how much the dry herb and wax vaporizer costs. - Prep Time - To use the Sublimator, you will need to spend time setting it up. The setup is rather complicated, and you will probably need to follow the instructions in the guide step by step the first few times you use it. The setup makes it rather cumbersome, and not a good fit for someone who wants to be able to quickly get their desktop device out and enjoy a session right away. - Portability - You can't really use the Sublimator Vaporizer on the go because it is so complex. The vape is also not very discreet. When fully assembled, it looks like lab equipment and is rather conspicuous. - Ease of Use - The Sublimato is challenging to use, but those who want very good quality vapor may find it's worth the effort. The vape can get hot to the touch, so you need to be careful during your session, and it's recommended that you buy the heat shield to protect your tabletop. The connections on the vaporizer are rather weak. If you bump the vape, or use it too aggressively, it can come apart. - Heating and Temperature Regulators - You can adjust the temperature settings of the Sublimator Vaporizer with the dial control, so it's possible to set the unit to the right heat for your needs. - Power Supply - Like other desktop vaporizers, the Sublimator must be plugged into a wall outlet for use. The Sublimator is not a desktop vaporizer that is ideal for everyone. This vape is best for more experienced users, who are most interested in a dry herb vaporizer that provides top notch vapor, and is highly efficient. For everyone else, the Volcano vaporizer provides a comparable experience with easier setup and simpler use.